Kolkata Knight Riders (KKR) registered a compressive win over Rajasthan Royals (RR) in the Indian Premier League 2019 (IPL 2019) match at the Sawai Mansingh Stadium in Jaipur. Knight Riders chased down the target of 140 runs in 13.5 overs with eight wickets in hand. Following the victory, KKR went past Chennai Super Kings (CSK) to top the IPL 2019 points table. RR, on the other hand, stay on seventh. RR vs KKR Highlights IPL 2019: Kolkata Knight Riders Register Comprehensive Win. The win was Knight Riders’ fourth of the season out of five matches, while for Royals it was the fourth defeat. KKR’s chase began on a positive note with openers Chris Lynn and Sunil Narine adding 91 runs for the first wicket. The duo batted with supremacy and took the game away from Royals. Narine was the aggressive of the two to begin with. The left-hander smashed three sixes and six fours during his 25-ball stay in which he scored 47 runs. Narine was dismissed in the ninth over by Shreyas Gopal. Following Narine’s dismissal, Lynn upped the ante and completed his half-century. He then perished after scoring 50 off 32 balls. He also hit six fours and three sixes. 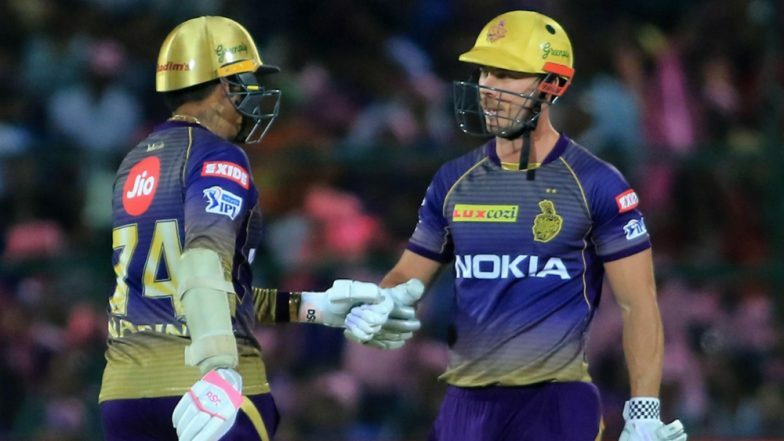 RR vs KKR, IPL 2019: Kolkata Batsman Chris Lynn Escape After Getting Bowled by Rajasthan Bowler Dhawal Kulkarni (Watch Video). Earlier batting first, Royals lost skipper Ajinkya Rahane early in the second over. Following Rahane’s dismissal, Jos Buttler and Steve Smith added 72 runs for the second wickets to bring some stability in RR’s innings. # This is KKR's joint-largest victory in terms of balls (37) remaining in IPL. # Royals have now scored the lowest total batting first losing three or less wickets in IPL. # Chris Lynn scored his seventh IPL half-century. # Steve Smith scored his sixth IPL half-century. # This was KKR's tenth win over RR in 19 matches. However, towards the end, Royals lost their way and were restricted to 139 for three in 20 overs. Buttler scored 37 off 34 balls. Rahul Tripathi was dismissed cheaply for six runs. Steve Smith finished unbeaten on 73 off 59 balls. Ben Stokes too remained not out but he struggled to add quick runs and managed only seven off 14 balls.